Ontario is deeply divided between its rural roots and explosive urban growth, with the PC party claiming the majority of rural ridings and the Liberals capturing the majority of urban ridings in the recent June elections. When Tim Hudak stepped down from his PC leadership role, the question of how the PC party would rebrand itself within the urban GTA community became even more pressing – what can be done to reconcile rural/urban values, which are often at odds with each other and what role can the PC party play in this process? On Monday, October 20th, WSIC hosted James Ellerton, a former Queen’s Park staffer and PC candidate that ran in the Toronto riding of Parkdale-High Park, and Leif Malling, a lawyer and strategist who helped develop the Blue Skies initiative – an “ideas incubator” for fresh thinking on the direction of Ontario’s Centre-Right and better ways to bridge the urban rural divide. Both Jamie and Leif acknowledged that the PC party still has challenges to overcome in its pursuit to appeal more to the core downtown Toronto populace. More focus needs to be given to speaking with voters and forming tangible connections with non-PC supporters to establish why the PC party is not appealing more to the urban community. In addition, our speakers felt it was important to revamp the PC approach of engaging with urban Ontario through better communication on how influential the party has been in the past – for example, highlighting the PCs successes of opening up the Toronto subway systems, a fact that many Torontonians are not necessarily aware of. 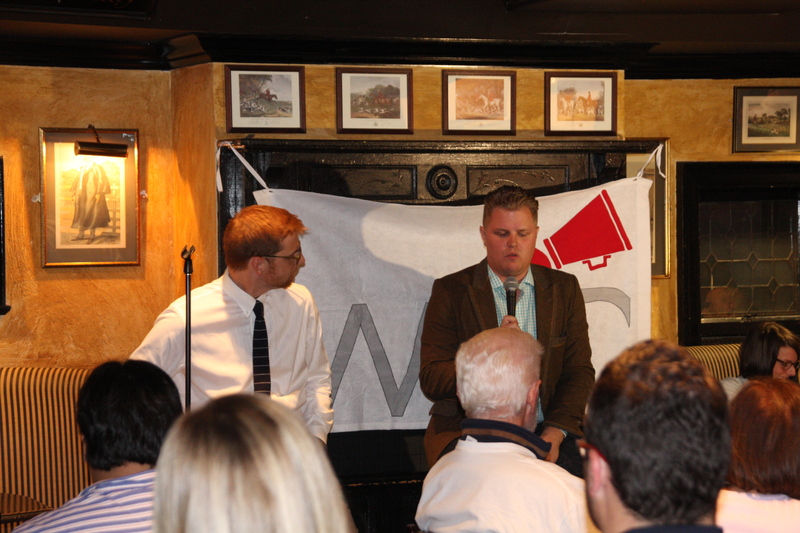 The mixed perception of the PC party was well represented in our WSIC audience members, with PC audience supporters commenting and affirming the points raised by our speakers, as well as audience members who had concerns with the party’s approach and platform. Several questions were put towards our speakers, covering a range of topics including the environment, overrepresentation of rural populations in the legislature, taxation, and the best way for the PC party to establish a real substantive dialogue with the GTA urban community. How do we define the urban and rural dividing line? Our speakers were of the view that there is no hard line we can draw, but rather, that line changes and shifts depending on the area. For example, Ontarians living in inner city Toronto often don’t need to drive anywhere and can access all necessary amenities within close proximity to where they live. Once we head into North Toronto and more suburb communities, there is a different way of living and changed focus. Heading further in the rural areas we hit communities that are agriculturally focussed and who have very particular concerns and thoughts on what is important for them. For the PC party to be successful going forwards, more needs to be done to better appreciate and understand the needs of each of these communities, as well as a better way of communicating those needs to the rest of the province. Equally, it is important that urban and rural dwellers better understand and appreciate core issues that are symbolic and representative to each community. For example, rural communities are much more concerned with hunting permits and the implication of gun ownership laws for this purpose than urban communities. A successful PC party will be able to appreciate symbols on each side and be able to demonstrate to both the rural and urban communities the importance and significance of those symbols to one another. Ultimately, the point that was driven home by our speakers was the continued importance of dialogue with members of both the urban and rural communities, so that there was a clear and strong understanding of respective needs and concerns, and so that these issues can be properly addressed. Both Jamie and Leif acknowledged that Ontario urbanites held on to fixed views of the PC party, and only with time and ongoing dialogue will this perception be changed and better credibility be established in urban areas.